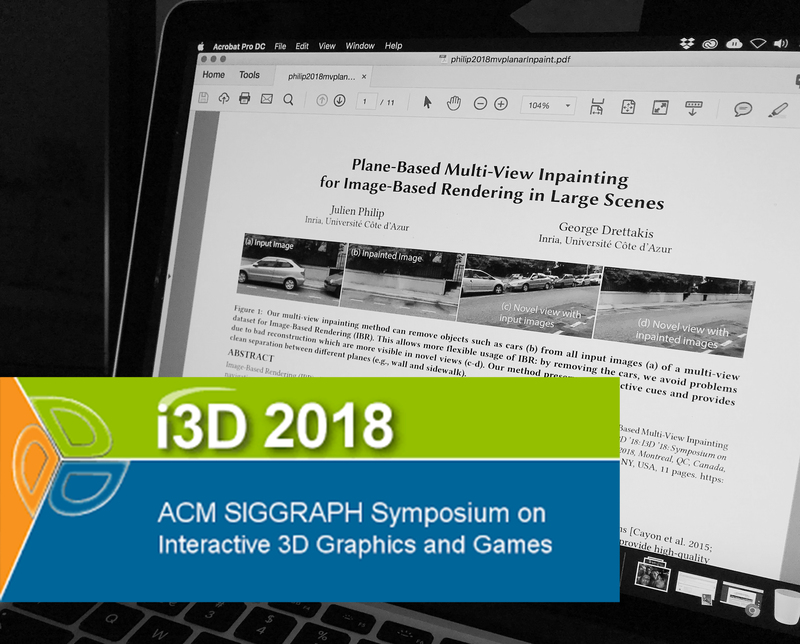 EMOTIVE Ph.D. student Julien Philip from Inria presented a paper ‘Plane-Based Multi-View Inpainting for Image-Based Rendering in Large Scenes’ at the ACM SIGGRAPH Symposium on Interactive 3D Graphics and Games (i3D) in Montreal, Quebec, Canada on 17 May 2018. This is the leading conference for real time 3D computer graphics and human interaction. The paper presents Inria’s algorithm on multi-view inpainting that allows the modification of virtual reconstructions and their highly-realistic visualization. The method improves Image-Based Rendering systems by allowing automatic removal of objects in a large set of photographs of an existing site, and automatic filling of the content behind the removed objects in all of the photos. The new method achieves unprecedented quality and speed; the method is a powerful new tool in enhancing virtual reconstruction and visualization of heritage sites uses photographs.